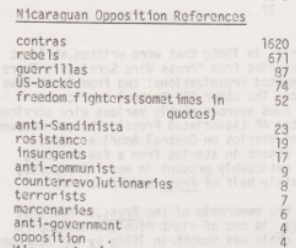 In the 1980s, the Reagan Administration was obsessed with countering the revolutionary movements in Central America. At the time, there was almost daily national news coverage of US policy in Central America, whether it was funding for the Contras, counterinsurgency campaigns in Guatemala and El Salvador, military training programs in Honduras or the drugs for guns scandal involving high ranking officials in the US government, personified by then Army Colonel Oliver North. 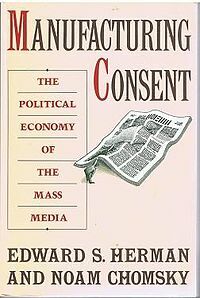 The national news coverage of Central America in the US was being diagnosed by media scholars Noam Chomsky and Edward Herman in their major work Manufacturing Consent: The Political Economy of the Mass Media, as well as Chomsky’s stand alone book Necessary Illusions: Thought Control in a Democratic Society. However, little attention was being paid to how local news agencies were reporting on the issue. During a 3 year period, Richa and I produced two major studies of how the Grand Rapids Press reported on US Policy in Central America. The first study looked at coverage from 1986 and the second report investigated coverage from 1990. We focused on the Grand Rapids Press, since it is the only daily newspaper in Grand Rapids and all other major news outlets tend to follow the Press’ lead on what stories to cover. We also felt that it was important for us to understand how people’s understanding of Central America was being shaped by local media. The first report, released in 1989, was entitled Aggravations: A Critical Look at How the Grand Rapids Press Reports on Central America. This 13 page report had an introduction, methodology, a data section, content analysis section and a list of recommendations. A disproportionately large number of sources in the articles were US government sources, supporters of US policy or government leaders from countries the US supported. Rarely were regular people in Central America used as a news source. Nicaragua was the primary focus of the news stories, with few stories on El Salvador, Guatemala, Honduras, Costa Rica, Belize or Panama. A disproportionate number of stories were framed in such a way to present US policy and the countries it supported as being proponents of human rights. We published and distributed 500 copies that those involved in Central American Solidarity work used as an organizing tool, especially when engaging the general public that was being propagandized by the major news sources available to them. 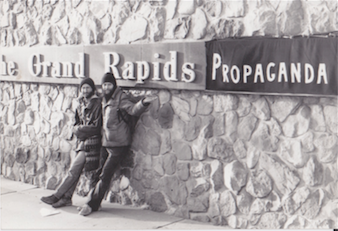 The project was such a success that the following year (1990) we decided to monitor the Grand Rapids Press as the year unfolded in order to collect the data and begin seeking out independent sources of information. The second report was entitled Mis-information: How the Grand Rapids Press Reports on Central America, had very similar conclusions to our first report, but with more extensive research and content analysis. We distributed 2,000 copies of the second report and even set up a meeting with then Press editor Mike Lloyd. When we got to the meeting at the GR Press building, we were invited into the office of the editor. The meeting lasted only 30 seconds, since just after arriving in his office, Mike Lloyd looked at us and said, “This is what I think of your report.” He then proceeded to throw it in the trash and told us to leave. His reluctance to even discuss the findings of our report might have been clouded by the cover picture we used for the report, but we didn’t really expect any other response than the one he gave us. This entry was posted in Central American Solidarity Movement and tagged Grand Rapids Central American Solidarity Movement, Grand Rapids Press Coverage of Central America. Bookmark the permalink.